Output Power: 127dBm to +7dBm (0_1µV to 500mV into 50W). 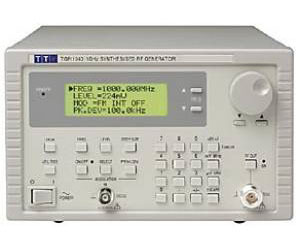 The TGR1040 is a low cost, synthesised RF signal generator which incorporates the essential features required for most development, test and service work - frequency accuracy and stability, wide dynamic range, low phase noise and low leakage. The generator incororates both internal and external FM. It is suitable for FM radio receiver sensitivity measurements, system gain measurements, receiver tuning & alignment, oscillator substitutions, EMC/antenna/field strength measurements and as a signal source for many other RF circuit and system development tasks. The instrument can be operated manually via the front panel or can be remotely controlled via the RS-232 interface (standard) or GPIB interface (optional). Nine memories are provided for user set-ups. In addition the generator''''s low cost, it’s ease of use and remote control capabilities make it eminently suitable for most production and development applications where a basic, stable signal source is required.